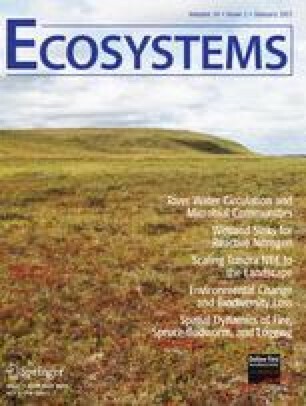 We scale a model of net ecosystem CO2 exchange (NEE) for tundra ecosystems and assess model performance using eddy covariance measurements at three tundra sites. The model, initially developed using instantaneous (seconds–minutes) chamber flux (~m2) observations, independently represents ecosystem respiration (ER) and gross primary production (GPP), and requires only temperature (T), photosynthetic photon flux density (I 0), and leaf area index (L) as inputs. We used a synthetic data set to parameterize the model so that available in situ observations could be used to assess the model. The model was then scaled temporally to daily resolution and spatially to about 1 km2 resolution, and predicted values of NEE, and associated input variables, were compared to observations obtained from eddy covariance measurements at three flux tower sites over several growing seasons. We compared observations to modeled NEE calculated using T and I 0 measured at the towers, and L derived from MODIS data. Cumulative NEE estimates were within 17 and 11% of instrumentation period and growing season observations, respectively. Predictions improved when one site-year experiencing anomalously dry conditions was excluded, indicating the potential importance of stomatal control on GPP and/or soil moisture on ER. Notable differences in model performance resulted from ER model formulations and differences in how L was estimated. Additional work is needed to gain better predictive ability in terms of ER and L. However, our results demonstrate the potential of this model to permit landscape scale estimates of NEE using relatively few and simple driving variables that are easily obtained via satellite remote sensing. MML, EBR, and SJG conceived the study, MML performed the research, MML, AVR, GRS, ERH, and PML analyzed data, MML wrote the paper. We acknowledge funding from the National Science Foundation (Grants OPP-0732954 to WHRC, and OPP-0632139, OPP-0808789, DEB-0829285, and DEB-0423385to the MBL), and from the Canadian Foundation of Climate and Atmospheric Sciences to PML and ERH. R Development Core Team, 2009. R: a language and environment for statistical computing. R FOUNDATION FOR STATISTICAL COmputing, Vienna, Austria. ISBN 3-900051-07-0, http://www.R-project.org. Rocha A, Shaver G, In Press. Burn severity influences post-fire CO2 exchange in arctic tundra. Ecol Appl. doi: 10.1890/10-0255.1.